Once upon a time, there were two brothers, Juro and Goro, who had their father killed by a man named Kudo. One day, Kudo is assigned an important job by Minamoto Yoritomo, the man who was reigning the country at the time. He holds a party to celebrate the assignment, to which Asahina brings the two brothers. Kudo notices that the two brothers were the sons of a man whom he had once killed, and tells them in details how thier father died. Asahina, trying to stop them from attacking Kudo with swords, asks Kudo to offer the two men sake cups. Juro receives the cup despite his brother urging him not to. Goro, in an impulse of anger and resentment,smashes the sanbo(a small wooden table for offering food and drinks) that held the sake cup.The two men keeps wanting to their revenge on Kudo right there but he tells them to wait, explaining that he will give then the opportunity ti kill him when he meets them again. The scene closes with Kudo promising that they will get to meet him again. The older brother of Goro,Who is soft and calm. The younger brother of Juro, who is youthful and impetuous. A man who arranges the brothers meet Kudo but keeps a neutral stance.Asahina is a comical character. A courtesan based at abrothel in Oiso(now in Kanagawa Pref. ).Tora is Juro’s lover. Also a courtesan in Oiso.Shosho is Goro’s lover. 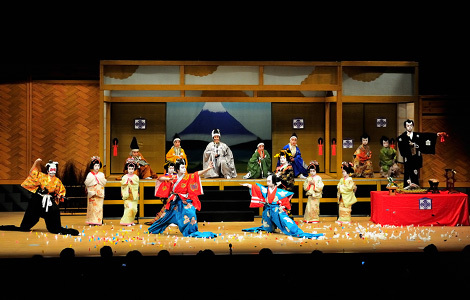 Due to its festive-sounding title starting with the word “kotobuki” (meaning “felicitation”), “Kotobuki Soga no Taimen” is a popular New Year program in both jikabuki and o-kabuki. With the combination of colorful characters, including the majestic Kudo, the brothers of soft-mannered Juro and aggressive Goro and their lovers, the handsome Tora and the feminine Shosho, and the comic Asahina, the “Kudo’s mansion” scene is packed with very Kabuki-like, stylized beauty and entertainment. Goro,fuming with anger, keeps refusing the sake that was offered to him, and in the end smashes the sanbo where the sake cup was placed. At the end of the scene, all the characters strike a majestic pose as if in a picture.